This weekend brought another wave of bad PR for the NFL in the former of #Goodellmustgo—and it’s threatening to take down one of its key sponsors. 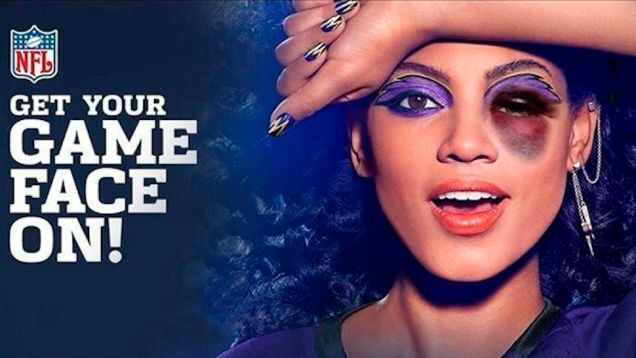 The photoshopped image below was taken and modified from CoverGirl’s “Get Your Game Face On” campaign, which sought to create a series of “official team makeup looks,” and paired with the trending hashtag #Goodellmustgo. The company pimped it on its Facebook page, on Instagram, on Twitter, and even made an entire board of NFL makeup looks on Pinterest. Every team. Including Ray Rice’s team, the Baltimore Ravens. Fans excited about Girling the hell out while cheering on their team could find all of the looks on Cover Girl’s special NFL Game Face website. But today the website is gone and we’re left to wonder: is CoverGirl’s NFL partnership gone as well? Women’s groups are aggressively rallying for the commissioner to resign, and the hashtag #Goodellmustgo has taken off on social media. Senator Kirsten Gillibrand added her voice on Sunday by saying that there should be congressional hearings on the NFL’s handling of the scandal, while Maureen Dowd weighed in to say that Goodell must resign. ESPN anchor Hannah Storm also gave a passionate monologue on air that questioned the NFL’s values and integrity. In the wake of all the negative attention, the NFL head made a last-minute decision on Sunday to not attend the regular-season opener for the San Francisco 49ers at the new Levi’s Stadium. The Fortune piece theorizes that Goodell will remain in place thanks to the fact that the league he oversees is the world’s most profitable — and that he has developed very friendly relationships with its key corporate sponsors. But Ultraviolet and others want to ensure that this story doesn’t die down as quickly as others that have arisen for the NFL in recent years. The league must make several key choices moving forward. Ignoring the problem does not seem to be an option.